Our collection of books on stained glass began in the 1950s with seventeen titles and has grown considerably since then. 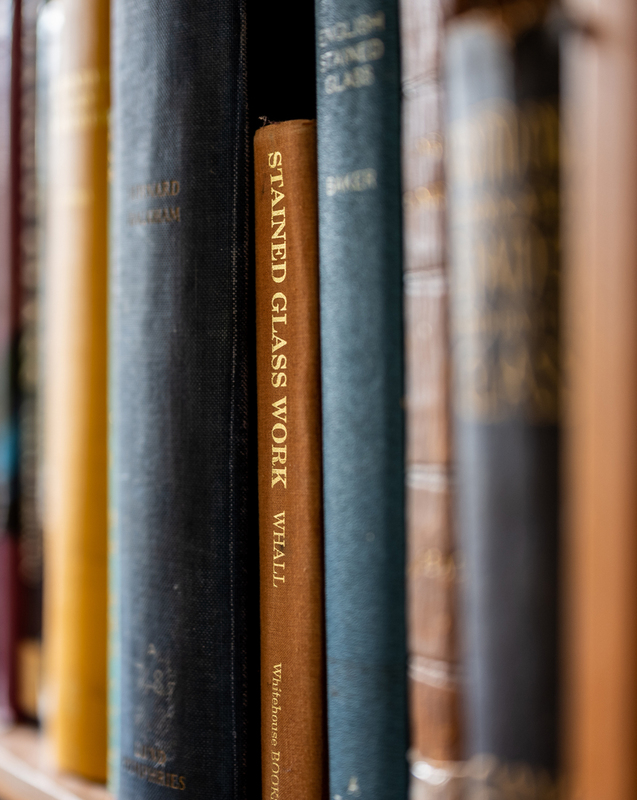 The British Society of Master Glass Painters’ first librarian, Hew Lewis Pawle, established a small nucleus of books on stained glass which were housed at A. K. Nicholson’s Stained Glass Studios, and the first Library List of seventeen titles was published in 1954. At Mr Pawle’s death in 1961 the Library was moved to the premises of James Hetley & Co. under the aegis of Hugh Salmond, who became Hon Librarian, and by 1964 the Library had grown to over a hundred volumes, mainly through donations. After a spell at Glaziers’ Hall under the care of Robert Lane, Hon Librarian for the Worshipful Company of Glaziers and Painters of Glass, the Library was moved yet again in 1985, this time to the National Monuments Record in Savile Row under the Society’s own Hon Librarian, Margaret Bell. Mrs Bell made a thorough review of all titles and, until her retirement from office in 1997, greatly augmented the collection with purchases and by encouraging donations of books. When the National Monuments Record moved its London search room to 55 Blandford Street, the Society’s Library at Savile Row went with it and, on closure of the search room there, the Society of Antiquaries of London kindly agreed to house our collection at their Library premises in Burlington House, Piccadilly, where it continues to complement the Antiquaries’ own fine collection of books on stained glass.